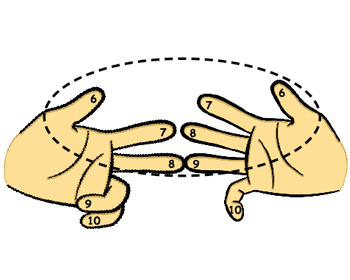 Remember that when we multiply 8 and 9 by fingers, we joined finger 8 on the left hand to finger 9 on the right hand. The two joined fingers and all the fingers above them are called TENS fingers. The fingers below the joined fingers are called ONES fingers. • There are 3 TENS finger on the left hand and 4 TENS fingeron the right hand. • There are 2 ONES finger on the left hand and 1 ONES finger on the right hand. • The number of ONES (3 + 2) and TENS (4 + 1) fingers on each hand always add up to 5. Also note how our numbers (8 and 9) relate to the numbers of ONES and TENS fingers. 9 = 10 – (number of ONES finger on right) = 10 – 1. R = 10 – b = number of ONES finger on the right. 5 – R = number of ONES finger on the right.